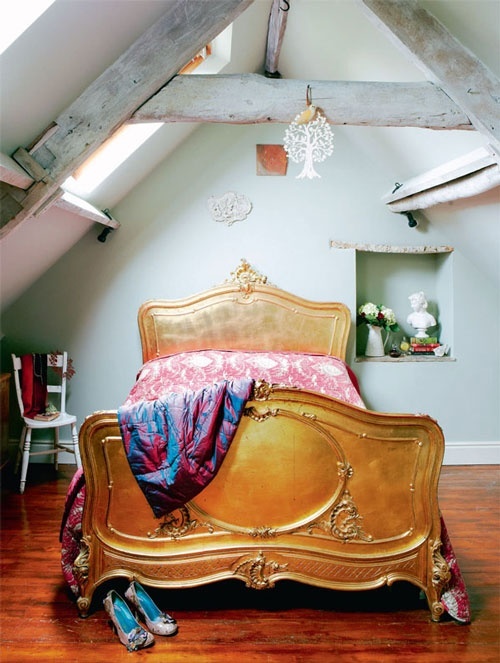 IF YOU POKE AROUND THE BEDROOM PHOTOS ON WEBSITES, BLOGS AND PINTEREST ENOUGH..AND YOU WILL BEGIN TO SEE THAT THE “QUINTESSENTIAL” PHOTO OF A BED…..
…ARE YOU SEEING A PATTERN HERE?…I HAVE SURMISED THAT IN ADDITION TO THE FACT THAT WE DO NOT NEED TO SEE THE WHOLE BED TO APPRECIATE IT…I ALSO THINK THESE IMAGES ARE ATTRACTIVE TO US BECAUSE ALL OF THESE PHOTOS EMPLOY THE RULE OF THIRDS WHICH IS WHERE SCIENCE AND ART MEET…. IT MAKES SENSE….I HAVE ALWAYS LIKED THINGS A LITTLE OFF CENTER…COMPARE THESE TWO SHOTS OF THE SAME BED…..
…IS ONE MORE APPEALING TO YOU EYE? DECORISTA – ONCE SOMEONE TOLD ME ABOUT THE RULE OF THREES (NOT TO BE CONFUSED WITH THE “RULE OF THIRDS” )…. BUT THAT THE PERFECT STYLING RECIPE IS THREE ITEMS…NOT FOUR AND NOT TWO..BUT THREE LIKE THE FLOWERS, PHOTO AND BOWL COMBO. STACY AND CHARLIE – GREAT BEDROOM MAKEOVER POST! 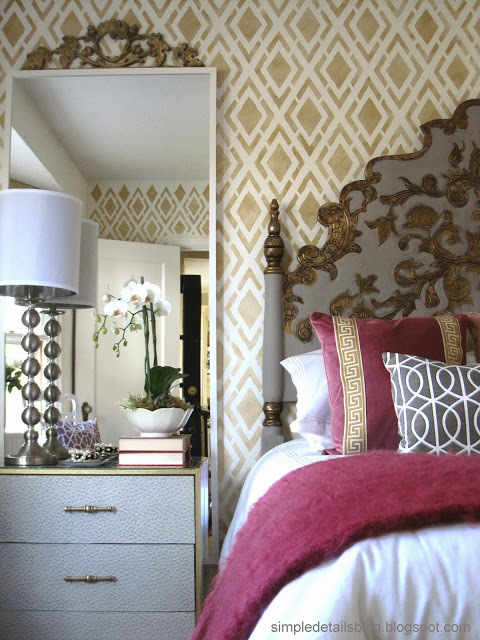 ..this bedroom was done for the One Room Challenge and I am absolutely crazy about this wallpaper…. 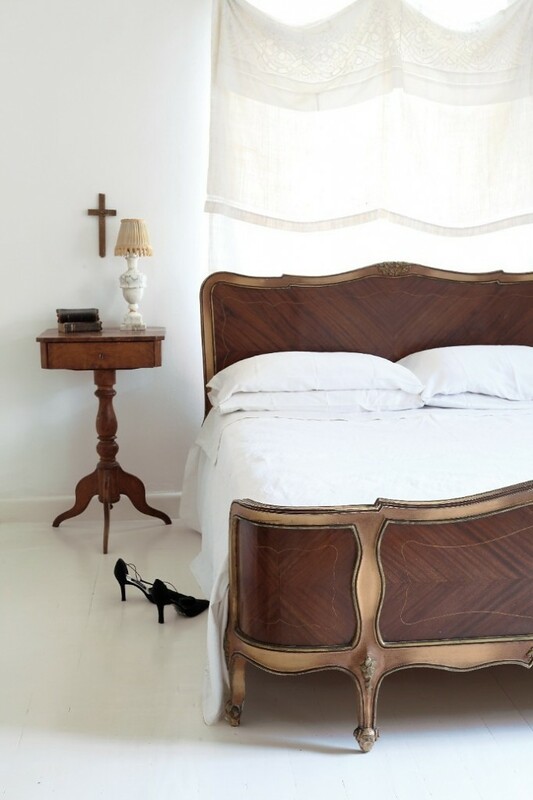 PERIOD LIVING – I love this bed, but my EYE was drawn to the makeshift bedside take in the wall..and the simple white chair…..how about you? The rule of thirds is fun…do I adhere to it all the time…absolutely not..but quite often accidentally. One of my BEST DECORATING TRICKS is that I will get a space or even a painting all finished and then I will take a photo…Sometimes standing and looking at the WHOLE space is too much for my tired brain to compute…but the finite quality of the photo enables me to SEE JUST the design and immediately I see what is working and often what is not and can tweak it. Like most of you, I am not a trained Interior Designer, I am just me and I know what I like…but often cannot figure out how to get there. Simple things like the “rule of thirds” help clear out the mind clutter and enables me to focus on the task at hand whether it be where to place a painting on the wall or a dog on a canvas or a child in a photograph…for me now it is almost second nature…your eye gets trained with practice…and in the end…it makes me happy! Clean and crisp interior designs! Thanks for sharing! The hardwood flooring in your home looks great. I love the pillow with the woman’s face too, very cool.